Classic volleys are shots that have a specific spin and use short arm and hand movements paired with specific footwork. Spin amounts vary, racket work is short, contained and precise. Footwork is dance-like, using repetitive patterns which adapt to different tempos and situations. When racket work and footwork sync together, you’ll have an efficient, all-court volley. There are many misconceptions about volleys. The dictionary definition of a tennis volley is: “To propel a tennis ball while in the air and before touching the ground.” This simplicity is key to success on the volley. Let’s get more specific about this definition: “Volleys are shots that are designed to intercept shots from the opposing side, before the ball bounces.” Volleys are hit from many places on the court, not just from the dominant position at the net. A majority of volleys are not power shots. When volleying, the intention is to deflect and redirect the ball to your benefit. You will learn to use the incoming ball to get what we want: Control and placement. You take control with a volley by changing the speed and direction of a ball using underspin. If we can use the pace, spin and height of an incoming ball, then we are in command. All classic volleys are hit with underspin (as opposed to a swing volley which has topspin). That is why your tennis pro insists on a grip that feels uncomfortable. The grip opens the racket face and allows spin to be hit. Technically, we use a Continental Grip for the volley, but typically, this grip is too extreme for most players, especially if you are just coming from a Forehand Grip. So, if you use a Forehand Grip today, start moving your grip to the left (for right-handed player) or right (for a left-handed player). Lots of players call it “Slice” but let’s call it underspin. Slice seems to give players a mental picture of chopping the ball which causes all sorts of problems. It is also the specific name for a type of serve which has a completely different spin than underspin. Underspin simply denotes the particular way the ball spins backwards (as opposed to topspin where the ball spins forward). In order to hit underspin, the forward edge of the racket leads to the ball. The ball grips onto and slides across the center strings in order to gain control of it. In this way, we can change the speed and spin of an incoming ball and vary depths and angles of our hit. Underspin is used for ultimate control of a ball all over the court. We use it on volleys, approach shots, chip shots, drop shots, angles, serve returns, underspin drives, lobs and defensive shots. So, the Continental Grip (or slightly Modified Grip) is used for ALL shots except the power topspin forehand. This includes the dominant hand for a two-handed backhand, a one-handed backhand (even more extreme than Continental), the serve and overhead. Start with a good ready position. If you read my article in last month’s edition, then you are ahead of the game. In the case of the volley, it will give you the best start to a single volley or multiple volleys in a point. Remember that the ball goes where the racket face is facing at point of contact. A volley is a precision shot, so you need a still platform (the platform being your string bed) at contact. Any backswing reduces your ability to know exactly where your strings might be facing. Your lower body has a lot to do with that, too, but we’ll get to that later. Your arms move in tandem and are constantly corresponding to each other. They have to be taught how to act together for all tennis strokes. It is not possible to hit a correct tennis stroke or, in this case, a volley by using only your dominant, hitting arm. ►To stop backswing: React to an incoming ball by first determining whether it is a forehand or a backhand. From a ready position, simply lay back the wrist of your hitting arm, while keeping the non-dominant hand close by (eight- to 12-inches). Both hands will raise to around shoulder height in order to approach the ball from above contact point. ►The hit hand should basically line up with the hand in front of the elbow and the elbow in front of the shoulder. If your non-dominant hand goes back then your hit hand will also go back, creating a backswing. No matter how hard you try, you will not be able to keep your racket forward if the non-dominant hand goes away. ►With your hit arm wrist laid back and both hands forward, you will see the racket head in front of you. The tip of the racket will be tipped off to the right (for a righty) and to the left (for a lefty). The tip of the racket will NEVER be straight up and down. The front edge of the racket will be leading towards the ball. Now a crosscourt volley is very easy. ►To stop follow through: When the ball is approaching the racket face, both hands are still and out within sight. Just preceding contact the hit hand will push forward and the non-dominant hand will pull in towards the hit hand. If both hands abruptly STOP moving together at this point, you will have your best shot at a crisp and precise volley. Please understand that the volley described above is only the upper body portion. A good volley can only be hit when a corresponding footwork pattern is paired with the racket work. A volley is a movement shot. This means that you are in coordinated movement with your lower body during the shot unlike a ground stroke, which is a stationary shot. The typical description for volley footwork is to “step into” the shot with a specific leg. While it is correct to get a specific foot and leg forward on a volley, the description is incorrect and confusing. Volleys are one-step, dynamic push-off shots. “Stepping in” on any shot is created by pushing off of the opposite leg. 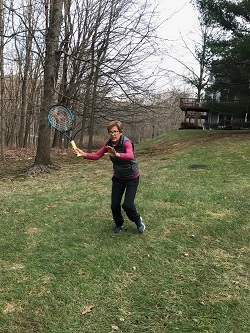 For the volley, your weight is placed on one leg in tandem with the set of the racket face. To set your weight you simply unweight or take it off of the other foot and leg. If weight is loaded then it’s obvious to the body which leg can push off dynamically into the hit. Then you will understand what it is to hit a volley. Your hands and feet like to move at the same speed. Since you are not creating any speed with a swing, then the speed you hit is determined by how slowly or quickly you push off to the hit. If you push off fast and powerfully, then your hands will fire more quickly for a more powerful volley. If you push off more slowly, then your hands will correspond and move more slowly and softly, allowing you to take pace off of a ball. Use the steps below to pair racket work with footwork for the volley. The information is written for a right-handed player. For ease of explanation, we will be describing a forehand volley only. 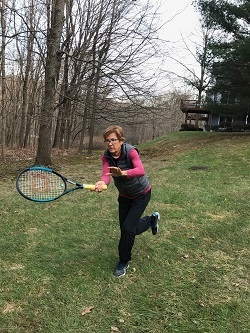 ►From the ready position, with a wide stance, set the racket face forward and within sight with the tip angled out to the right. Keep the non-dominant hand close. 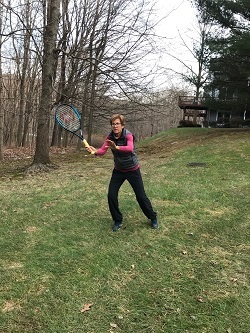 With the set of the racket, your weight will shift to the same side leg, the right leg (see Fig. 1). ►In order to time the hit, as the incoming ball approaches, you may need to hold your weight on that leg briefly or quickly push off of it. You will learn to accommodate the incoming ball by timing the push off. In order to move diagonally forward to a volley, you will need pivot on the pushing leg in varying amounts (see Fig. 2). ►After the push off, you will strike the ball leading with the front edge of the racket. This will create underspin. You will then be landing on the lead foot, in this case the left foot and leg (see Fig. 3). ►So, to make the timing understandable and repeatable, you’ll need to do three things at the same moment: Strike the ball with the racket, pull the non-dominant hand in towards the hit hand and land on the left foot. ►It is important that you let your weight carry forward onto the landing leg. The landing leg acts like a shock absorber, accepting your forceful weight onto a flexible hip, knee and ankle. From here, you’ll catch and rebalance your weight with the right foot and leg. Written information about a series of movements and grips can be very difficult to understand. That being said, it is important to form a solid concept of what you are attempting to do in order to be successful. Sometimes reading and digesting information can be just what is needed in order to form a good mental outline of a particular stroke. Start getting a better understanding of what underspin is and why it is used for the volley. Learn to use your non-dominant side to reduce backswing and follow through. Combine your racket work and footwork and enjoy frustrating your opponents with your dependable, all-court volley.